Cats are cute and sometimes cuddly, but no one would ever accuse them of being cooperative—which probably makes them less than ideal game show contestants. 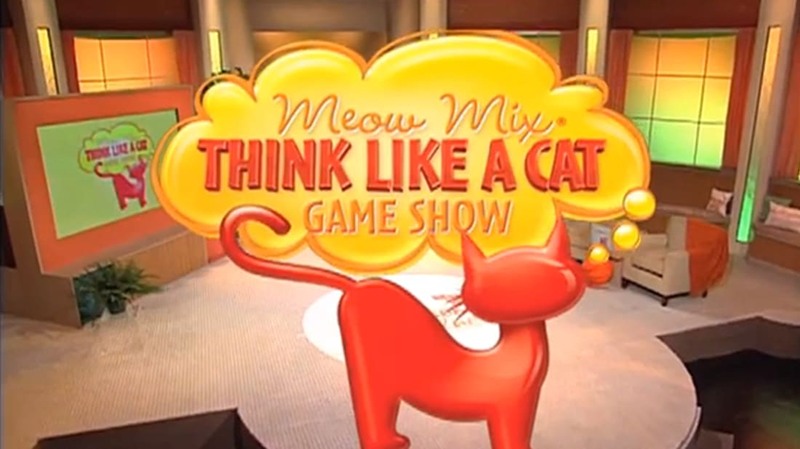 But that didn't deter Meow Mix and the Game Show Network from airing the first—and probably only—cat game show, Think Like a Cat, in November 2008. The contest was hosted by Chuck Woolery (the original host of Wheel of Fortune, among other game shows) and pitted eight feline–human pairs against each other in the quest to win $1 million. "In my game show career I've worked with TV stars, film stars, sports figures, legendary musicians, and many other contestants,” Woolery said in a press release. “Now I'm thrilled to be working with my furry friends, cats. It's a first for me and I'm delighted to be partnering with Meow Mix and GSN." Think Like a Cat aired just a single episode. Here's what went down. The lightning round, "The Fast and the Furriest," saw each cat placed in front of a bowl of food. The first three to finish their bowls (or the three to eat the most when time was up) would move on to the second round. The winners of this round were Tabby, Spooky D. Cat, and Quinn; they advanced, while the other contestants were awarded consolation prizes of $1000 and bags of cat food. ROUND TWO: ARE YOU SMARTER THAN A CAT? The lowest scoring human was Simone; she was eliminated, and went home with $10,000 and some cat food, and $1000 was donated to the feline charity of her choice. Before this round, the cats had been recorded in different situations; the owners had to wager points on what their felines would do before the clip was played. For the first question, the owners could not wager more than half their points, but after that, they could wager any or all of their points. The highest scoring pair was Ian and Quinn, won $25,000 and moved on to the bonus round; Alma and Tabby left with $15,000 and the cat food, and $1500 was donated to their favorite kitty charity. This round required cat and human to work together. Ten bags of Meow Mix containing various food symbols were placed around the studio—but only two bags contained the same symbol. Ian and Quinn each chose a bag; if the bags had matching symbols, they would win $1 million, plus $100,000 to donate to the shelter of their choice. Quinn chose bag #7, which contained a red snapper, and Ian chose bag #2, which contained ... a salmon. The correct bags were #4 and #6, which contained chickens. They didn't win $1 million, but did go home with $25,000 and the cat food, and $2500 was donated to their favorite cat charity. Sadly, no other episodes of Think Like a Cat were produced, so any felines craving fame will have to get it the old fashioned way: by becoming an Internet meme.